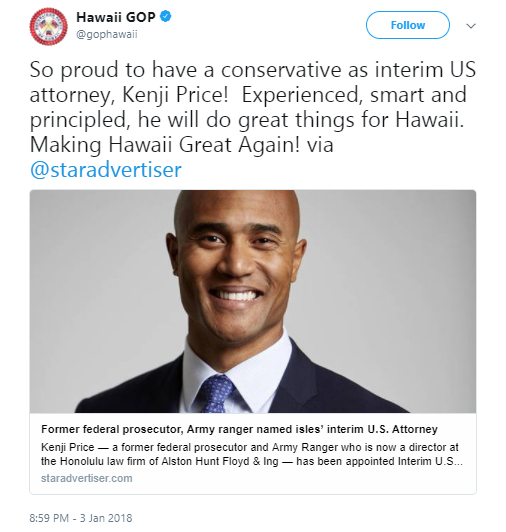 U.S. Attorney General Jeff Sessions has appointed Army Ranger veteran and former federal prosecutor Kenji Price as interim U.S. attorney for the state of Hawaii, the Department of Justice announced Wednesday. Price’s appointment goes into effect Friday. Price, who grew up in Hawaii, currently serves as a director at Alston Hunt Floyd & Ing, “where his practice focuses on white collar criminal defense and commercial litigation,” the Justice Department said. “Mr. Price previously served as an Assistant United States Attorney in the Eastern District of New York, where he prosecuted a variety of cases involving domestic and international narcotics trafficking and other federal offenses,” the Department said. Price served as an officer in the U.S. Army for approximately four years, during which time he served as a member of the 75th Ranger Regiment and the 173rd Airborne Brigade. Price is one of 17 temporary U.S. attorneys announced Wednesday who are permitted to serve in the position for 300 days.